As we do our informal tot school over the summer, I’ve been looking for different ways to get Squeaker engaged. It’s not something that I want to force with her because I want her to enjoy the summer. We’ve been spending a bit of time outside, but only when it’s not too humid or hot. Most of the time she’s content to just play in her little wading pool or we’ll head up to the park to go play in the splash pool. Yesterday though, we tried out something different. The end result? 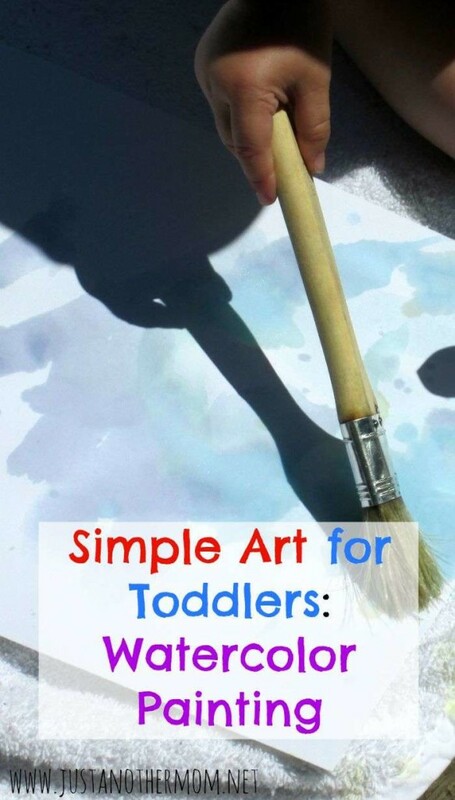 Easy watercolor painting for toddlers. She had fun with it and afterwards, we played with the hose. While you could most certainly does this indoors as well, we chose to go outside so we could get some fresh air and sunshine. After mixing the colors (I used about five drops for each color- red, blue, yellow, green and then did purple with four drops each of red and blue), we went outside. I set the towel down on the deck first for her to have a softer spot to paint on. While she did do a few brushstrokes, she also enjoyed dripping the paint onto the cardstock. And of course, her favorite part was playing with the hose when she was done. Though I didn’t get a picture of it, after the paint dried it had a nice pastel hue to it. So definitely not the type for bold, vibrant colors. But, because it was just water and food coloring, it washed off very easily when she also decided to paint her legs and arms. 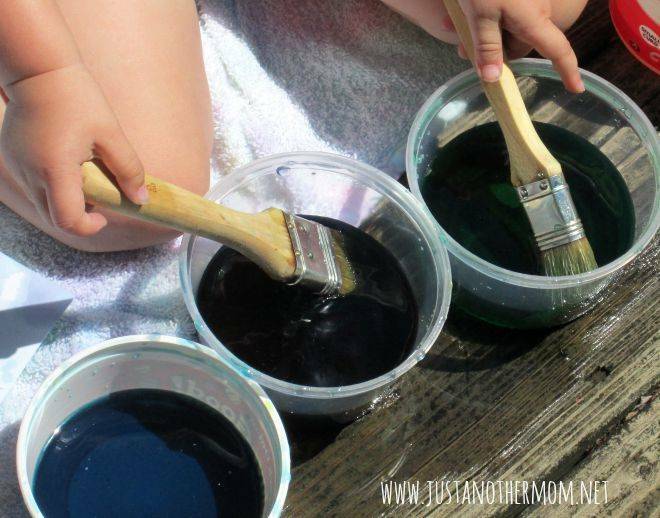 For more fun ideas for toddlers, be sure to follow Just Another Mom on Pinterest! Follow Just Another Mom’s board Fun with Toddlers on Pinterest. It’s great to know that this washes off so easily! I tried Kool-Aid painting with Little Man recently and it did not come off quite so well. He loved the painting aspect, so I’ll have it try it your way! Yes! It was mostly water (just enough food coloring to get some color) so it was easy to wash off.